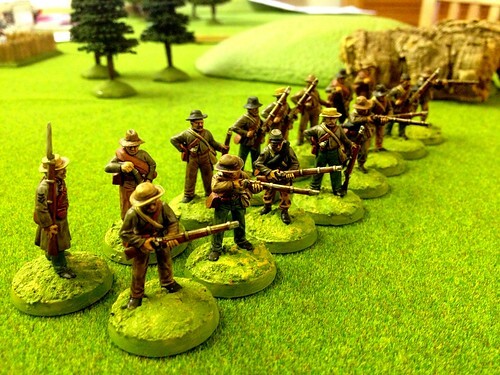 For some time I have painted 28mm American Civil War figures for pleasure and after the recent bout of painting 10mm something bigger seemed a treat. Then a friend showed interest in small actions involving the Brother Against Brother rules. However, I realised I would need to paint all of the figures. At that point The Perry Brothers came to the rescue with their new plastic figures. 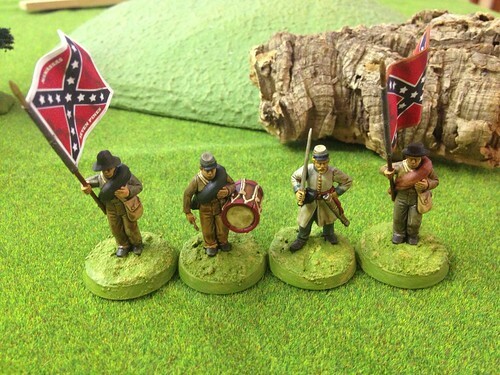 In the 1960s I had Airfix American Civil War figures but was too young to paint them. Happily they were in blue or grey plastic so small boys could tell one side from the other. 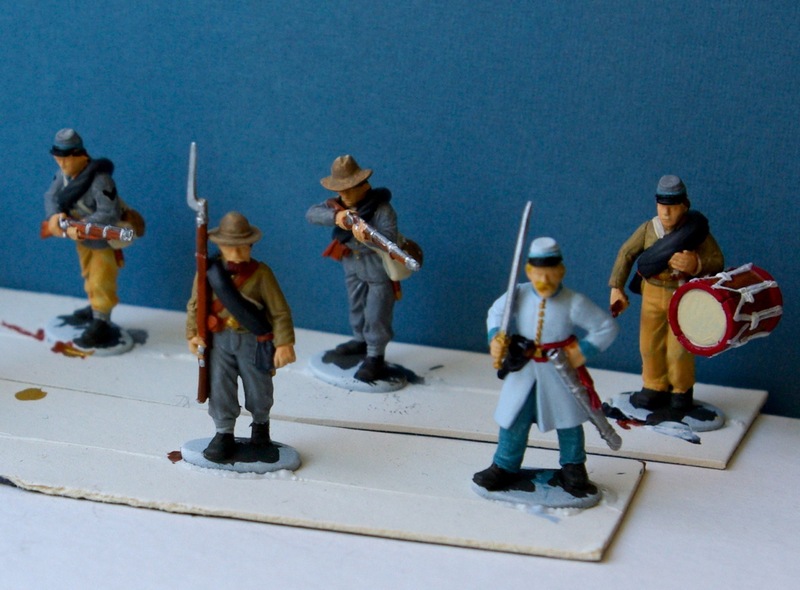 In the 1970s I moved up a size to Britain’s Swoppet multi-part American Civil War figures which were a delight and much coveted on trips to Selfridges’s toy department. After many battles in the garden with my Swoppets I sold them at the end of the 1970s. 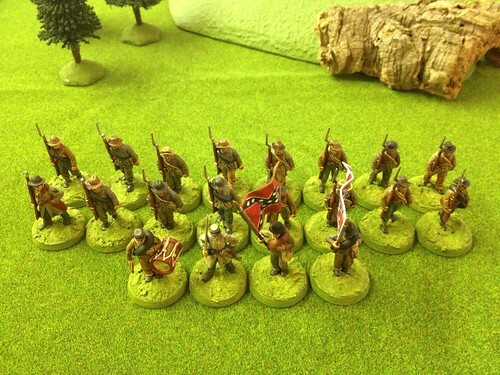 I returned to this period in 2005 after admiring a friend’s Renegade Miniatures figures and buying and painting some of my own. I purchased a box of the Perry figures and found you get lots of figures for your dosh which is always good! Some assembly is needed but not too much. Mainly it is the command figures and some figures that are loading or firing. Most of the other ranks are in sensible marching poses. You have a choice of assorted slouch hats and caps. The hats include types that can be painted as straw hats to ones that look like thy may have started life as a Hardee hat. The caps are mainly Union style “bummers” caps although there are a few kepi style caps included. I have used the latter on a few figures. Removing the figures from the sprue needs attention when cutting off the hats and caps otherwise it is easy to inflict some battle damage! All other pieces were straightforward to remove. Mould lines were minimal and quickly dealt with. There are a small number of areas where there are blocks of plastic because the moulds do not allow undercuts the way rubber moulds allow on metal figures. A bit of paint and a splosh of varnish will deal with them though! 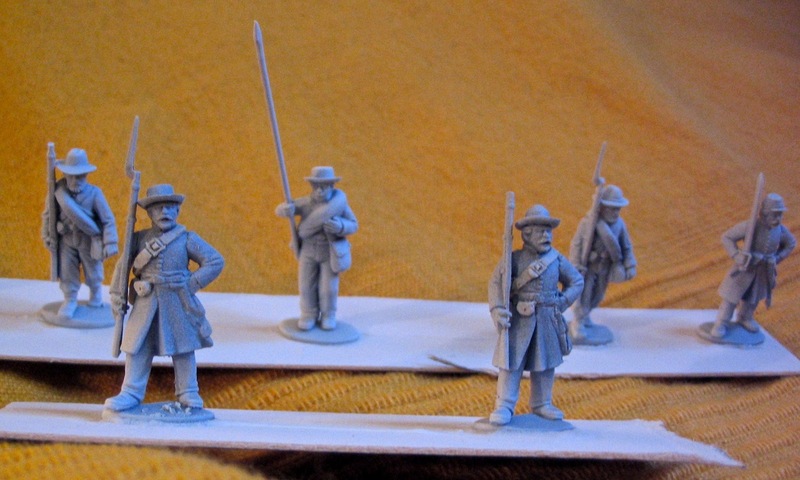 To date I have cleaned and prepared one batch of figures that will represent Confederate troops. A couple of officers are demoted to sergeants. Note how out of practice my sculpting is on those belts! My plan is to use simple warm block colours and then use a combined wood stain and varnish to add depth to the flat colours. That way I will get them finished quickly and they will have a robust varnish ready for my chum to use. Since the advent of the Army Painter dip products using a combination of stain and varnish has become deservedly popular. Old hands and cheapskates like me have used Ronseal and similar products for years. So far I have only used this technique on 15mm Biblical figures and 28mm goblins. That is I try to use it on figures where the palette I use is enhanced by a covering of dark brown wash. Hence I have used mostly warm tones on these figures, and I do not think this technique would suit the blue uniforms worn by union troops.